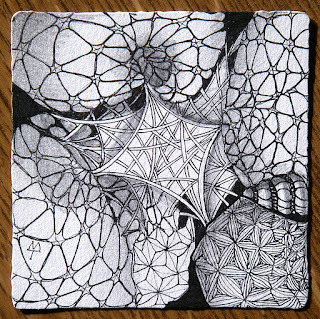 Fractals - Paradox and More! 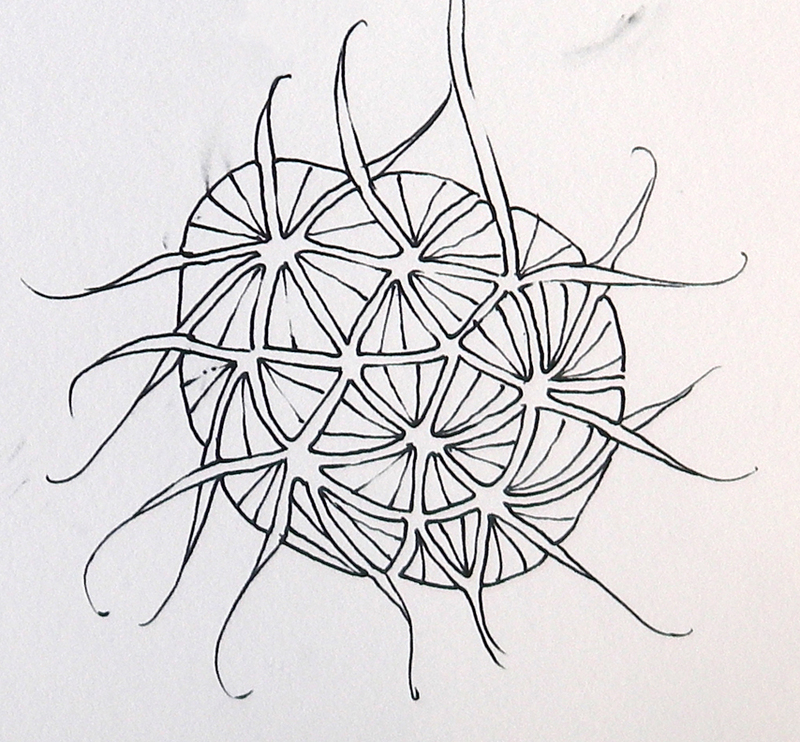 Your tangles remind me of the simple rules that drive fractals. 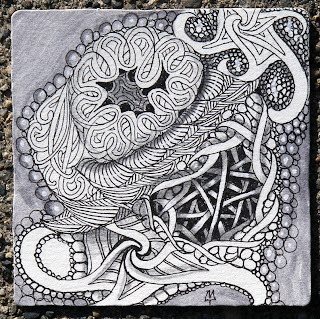 Amazing complexity emerges from simple strokes. 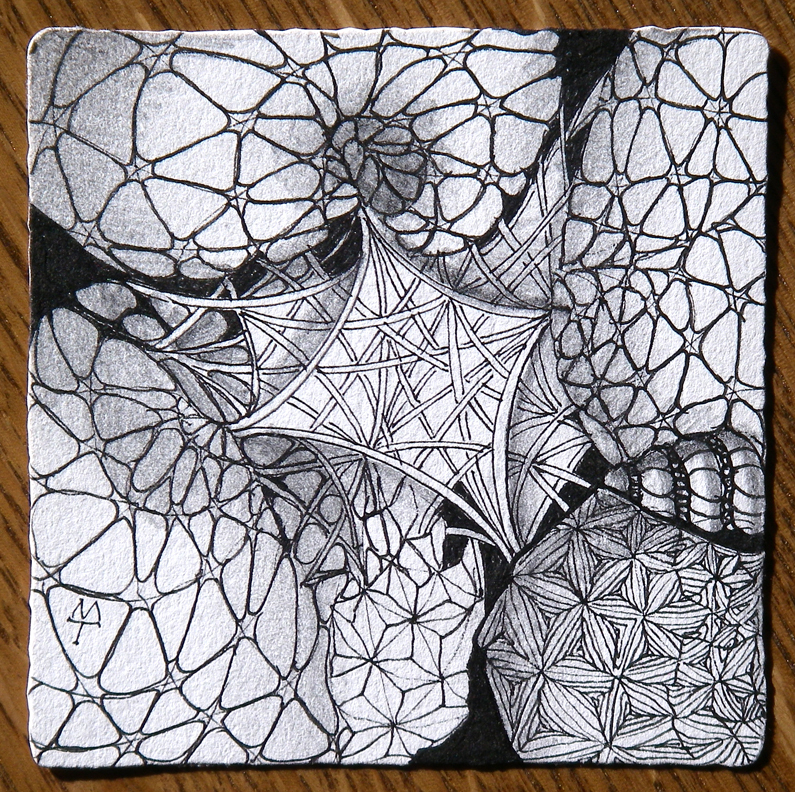 Fractals can be thought of as non-integer dimensions. Like 3.5D. Zentangles can be a path to bringing higher dimensional reality into 3D form. 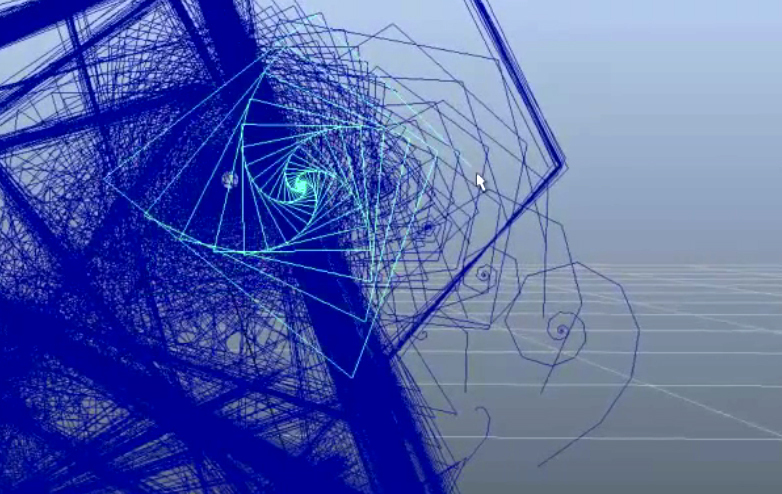 In his video, Duncan uses computer scripts that create the same pattern we call paradox. Notice in the image above as the lines get shorter, the width of the step from line to the one next to it also shortens. This subtlety makes for a beautifully curving spiral. We named this pattern "paradox" because by drawing only straight lines in a certain sequence, you automatically get beautiful curves. Duncan's YouTube, "Simplicity to Complexity" (below) is full of familiar tangles (like Carole Ohl's tink) and inspirations for new tangles. 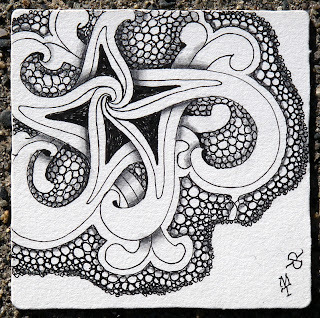 Many patterns in this video look like they would be fun to deconstruct and then reconstitute with pen and paper in a Zentangle way. Duncan is a principal scientist with Autodesk and shares more beautiful computer generated patterns on his blog, Duncan's Corner. We look forward to setting aside some time to enjoy them all. In exploring his blog, we learned a new word: Emergence. 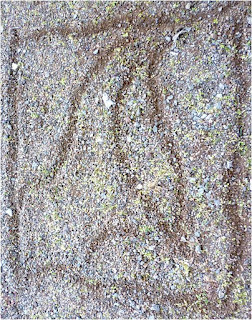 Duncan describes emergence as "a fascinating phenomenon where complexity can emerge through iteration of simple rules or processes." 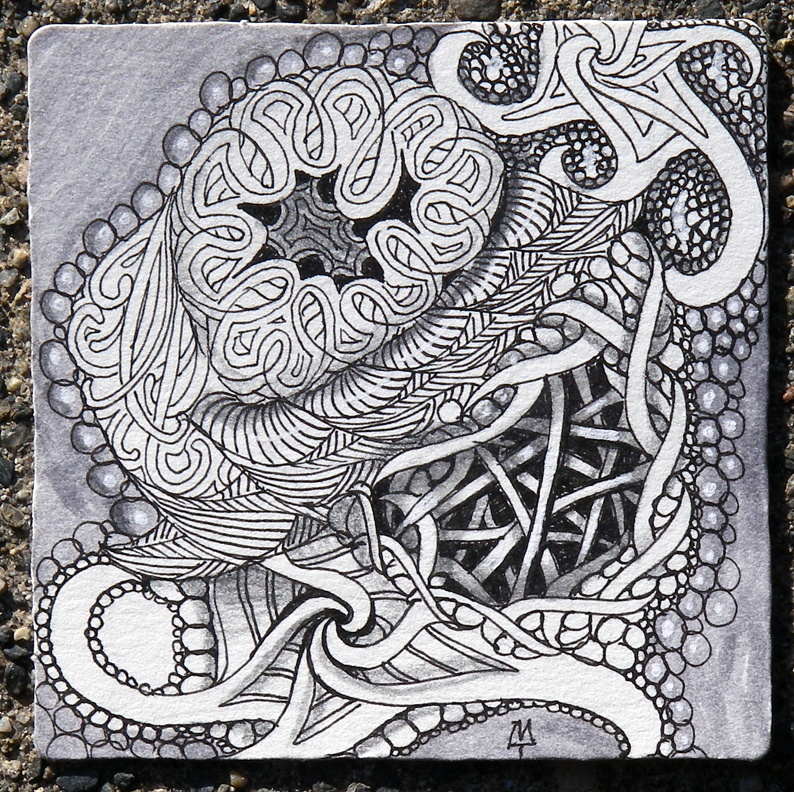 We think "emergence" is a good description of many Zentangle tangles and also the Zentangle process. Wikipedia's page on Emergence is an interesting read. Thanks to our friend for sharing this inspiring resource and thanks to Duncan for creating these videos. 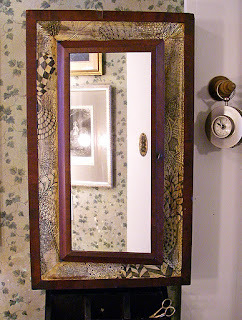 Click image for larger view and YouTube image for beautiful patterns. For more info on paradox, type "paradox" in the search field in the upper right on this page. Ever get one of those ideas that seems like a good idea at the time, but when you try it on, you're left with "What were we thinking?" We had this great idea for a blog (we thought). We took lots of pictures. But, it just didn't work. 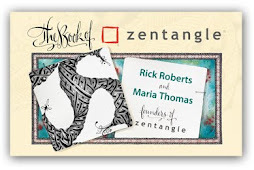 However, we really loved Maria's Zentangle that she created for the blog. That was a keeper and definitely worth sharing. This tile uses lots of Nzeppel. See how to do it here and here. Just in case you haven't seen them already, here are two gems that we want you to know about. 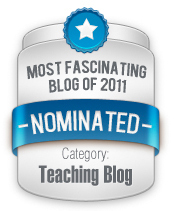 Congratulations to Laura Harms, CZT, for her always inspiring, and now nominated as an award-winning blog, I am the Diva! 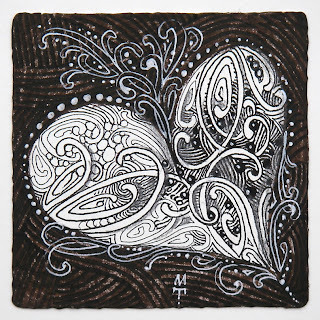 What do you do when you don't have all the materials and tools you need to create your Zentangle art? That's what Dilip Patel needed to figure out to complete Laura Harms' (see above :-) Challenge #54 while camping in the mountains of western India. We encourage you to go see how he "tangled" it in this blog entry. It's beautiful. A one-third to two-thirds proportion is a rough Fibonacci or Golden Ratio approximation. So, one-third dark to two-thirds light . . .
or vice-versa one-third light to two-thirds dark, either way. Naturally this is not an absolute! Much great art throughout all history does not follow this guideline. 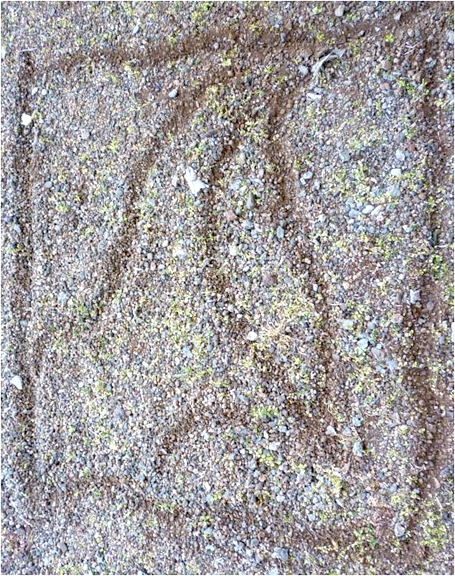 This is just an insight to occasionally ponder as you choose which tangle on your palette of patterns you will recreate with your pen. And as always . . . Enjoy! That's Joanna Campbell Slan's title for her most recent novella. 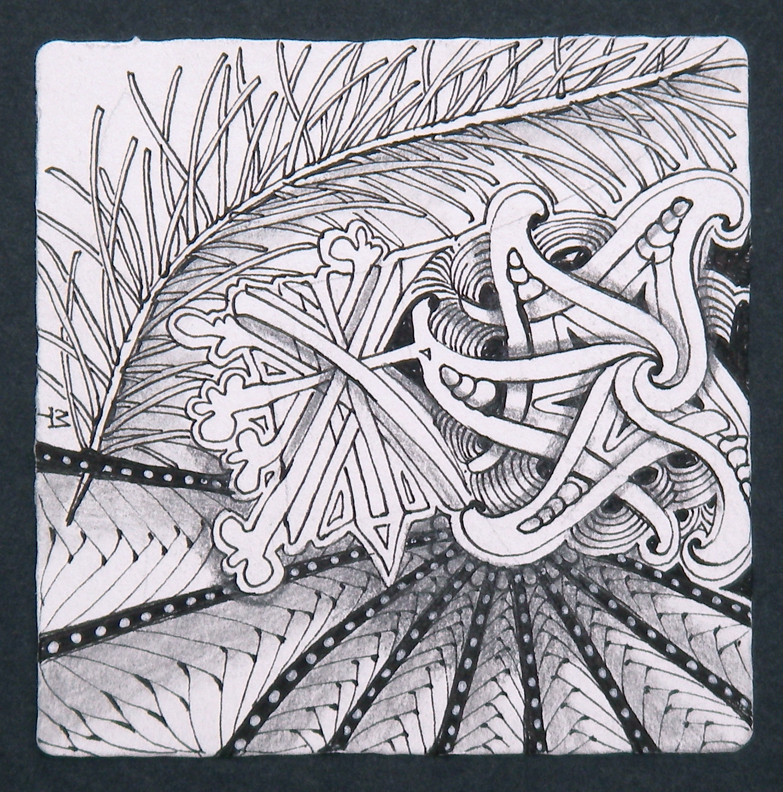 In Ink, Red, Dead, heroine, sleuth and scrapbooker extraordinaire, Kiki Lowenstein, discovers Zentangle and has lots of fun with it. We like to think that by creating Zentangle art (see cover), Kiki is better able to help her friend and maybe solve a murder! 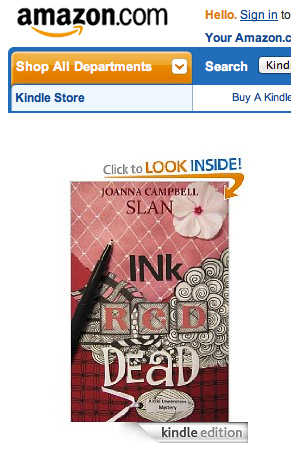 This is such a fun milestone - to see Zentangle as part of a book's plot line! 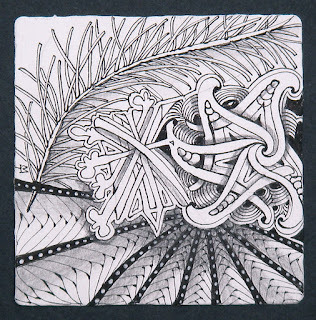 Joanna Slan does an excellent job of weaving an accurate portrayal of Zentangle into her book. Medicine Cabinet . . .
Or, what have you tangled lately? 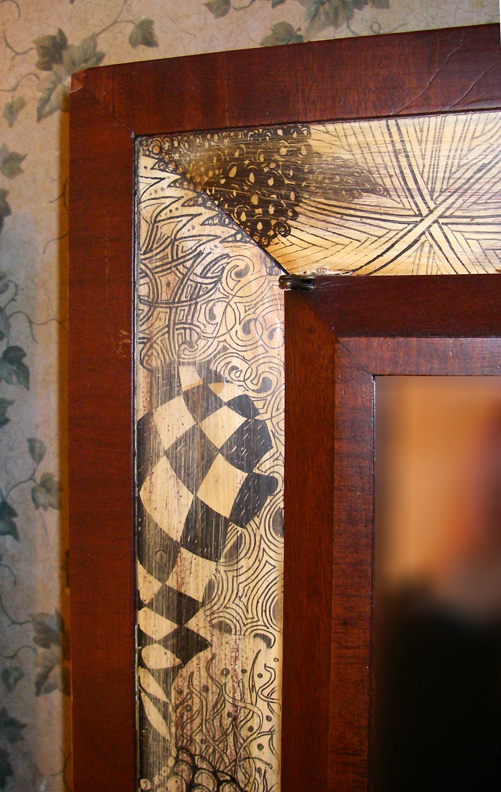 A couple years ago,we found an old clock case at a yard sale that had glass shelves in it instead of a clock. Maria said, "Let's get it." When we got home, Maria cleaned it up and applied gesso to the border to create a white background. 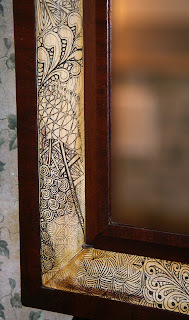 She used a black Sakura® Pigma™ Graphic 1 to tangle on the gesso. After distressing it with some sandpaper and stain she topped it off with a couple coats of polyurethane. A local glass store replaced the glass with a mirror and, Voilá, the medicine cabinet! Tell us some interesting things that you have tangled! Click images for closer views. Then Maria did something she does often and effortlessly, she turned a negative, positive. Extending that negative space between triangles turned it positive. 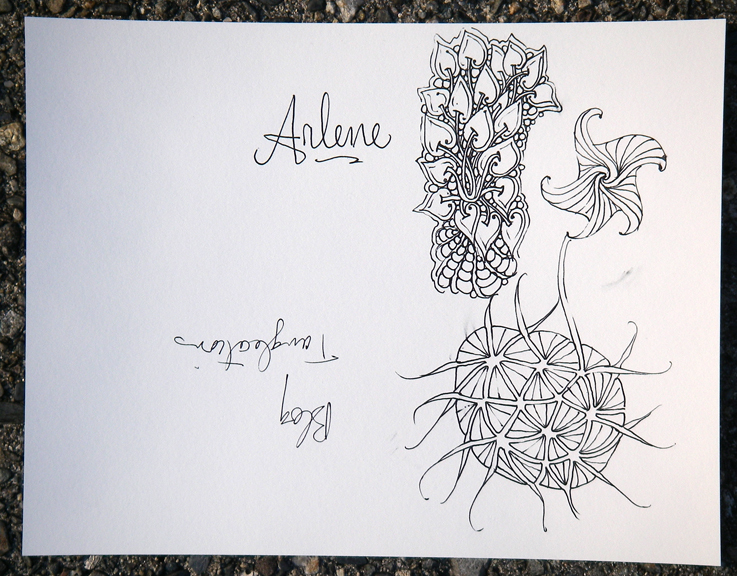 Whenever paths wanted to cross, then in hollibaugh fashion, she drew one behind the other. A Bit of Bubbly . . .
. . . for your New Year's Celebration. I never manage to stay up until midnight on New Year's Eve, even when I was younger. It just never seemed to have the appeal . . . watching the ball fall. But home is the bees knees . . . great food . . . warm fires . . . great company (even when I am alone) . . . the best rest . . . and comfort and joy. Always comfort and joy. 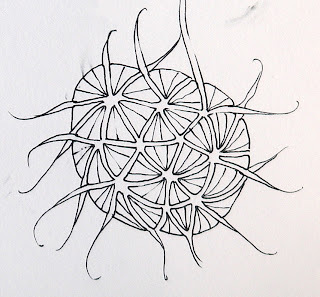 When you are tangling your favorite tangle and you want to add dimension (depth), character, contrast, or just some fun; instead of darkening the background, play with tiny orbs. 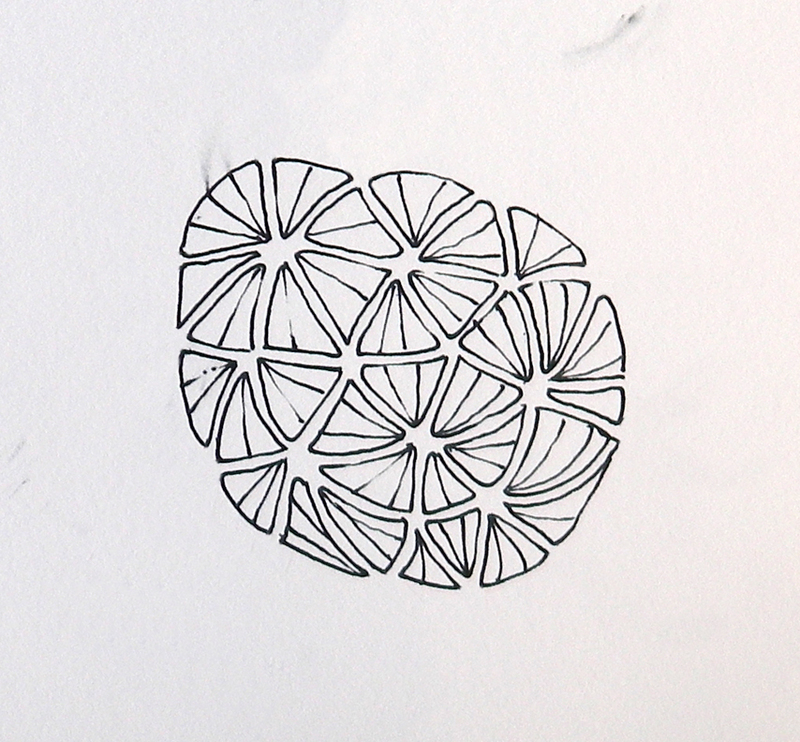 Starting around the perimeter of a space, draw the tiniest row of "orbs" (our word for circles) all around. Then the next row, just a smidge bigger orbs, then the next, you guessed it, a little bigger . . . and depending on the size of the space just keep going until you reach the center with the largest orb. 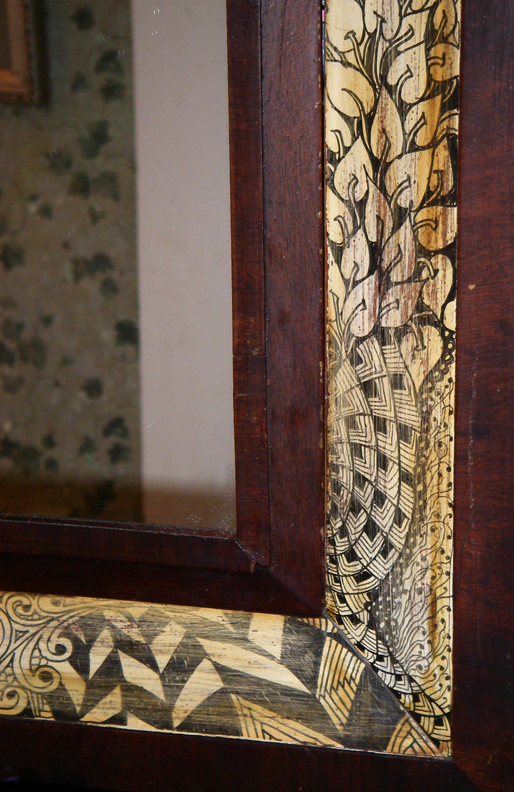 Then shade around the edge . . . maybe the first two rows of small orbs and VOILA! You have filled in a space with a tangle without even breaking a sweat. You can also go from large circles to small ones, too. This is a great way to "tone" an area and increase your focus at the same time. Focus on keeping the orbs the size you want, increasing or decreasing them ever so subtly. 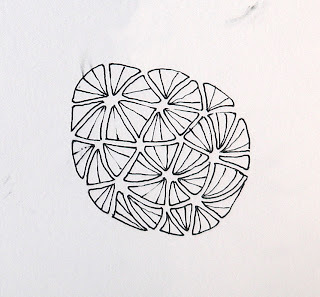 It will result in a shell-like texture, especially with shading. 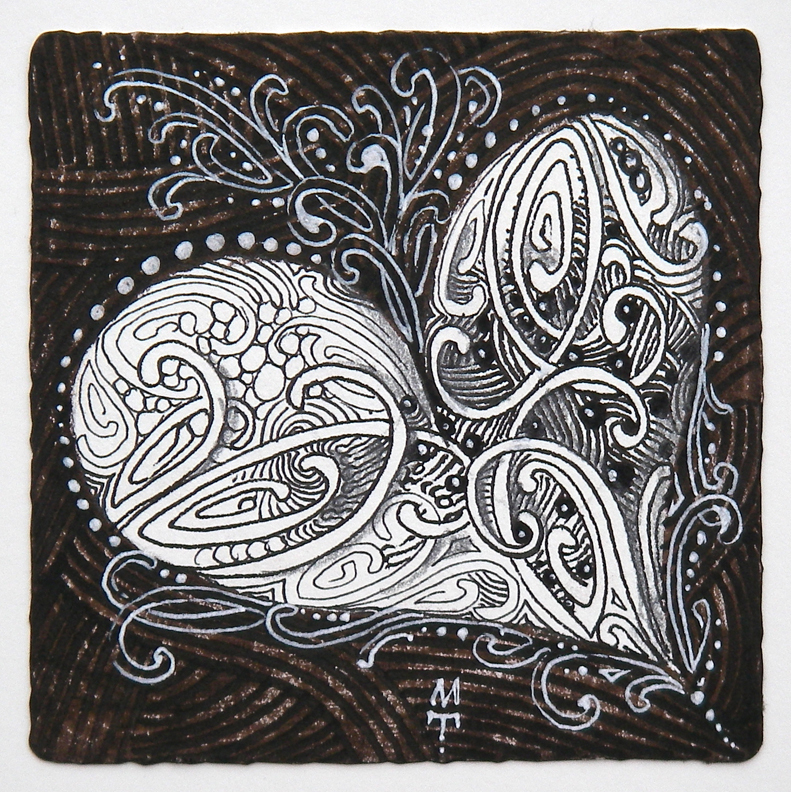 So give your Zentangle tile some "froth" and see what happens! A Year of Health, Wealth, Happiness and Love to all our Zentangle friends. Click images for more froth.